This is Cutco's unwavering promise and it is at the heart of everything we do. 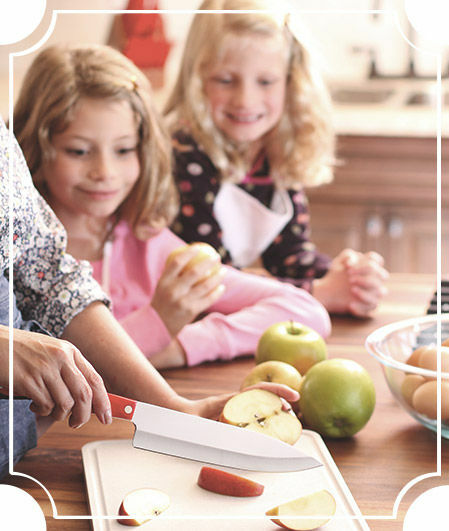 Cutco knives have been handed down from mothers to daughters, grandfathers to grandsons and between friends. In doing so, The Forever Guarantee has been passed along too. *View The Forever Guarantee below. When you send your well-loved Cutco products in for sharpening or repair they will be cared for as if they were our own. Your products go through a detailed multi-step process and are returned to you, ready to be used daily for years to come. There’s no receipt or registration required. Bring Cutco and The Forever Guarantee into your home today. For sharpening of Double-D® or straight-edge knives, send them along with a return shipping and handling fee of $9 (for 1 to 10 items) or $11 (for 11 to 25 items) or $13 (for 26 to 40 items) to the address below or submit a request online. There is a 40 item limit per service request.